The NRG-900 from GTA IV. Motorcycles are two-wheeled motor vehicles that have appeared in all Grand Theft Auto games except Grand Theft Auto 2, Grand Theft Auto III and Grand Theft Auto Advance. Other names and types associated to motorcycles in GTA include motorbicycle, motorbike, bike, crotch rocket, moped, and chopper. Motorcycles are smaller than most vehicles in the game. They are small and narrow enough to travel in places where larger vehicles normally cannot fit. 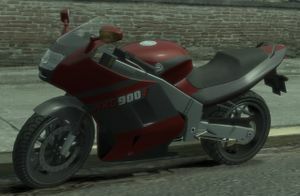 Since Grand Theft Auto: Vice City, the player can perform a forward drive-by while on any motorcycle. The downside of riding motorcycles is without a protective cage, the player can be ejected from the motorcycle during collisions and is prone to damage from gunfire. Getting busted is much easier as the cops do not have to open a door. Reversing on a motorcycles requires the character to use its feet to reverse, much slower than cars. In Grand Theft Auto: San Andreas, the player can increase the Bike Skill of Carl Johnson, either through long rides on motorcycles or lessons in the Bike School. The higher the skill, the less chance Carl will fall off the motorcycle and the more responsive the motorcycle is. In Grand Theft Auto IV and The Ballad of Gay Tony, after waiting for a moment after getting on a motorcycle, the player character and the passenger, if any, will put on a helmet. Some mission-specific characters will wear unique helmets not seen anywhere else in the game. In The Lost and Damned, the characters do not wear helmets, likely because of being more experienced riders as bikers. One slight inaccuracy in the operation of motorcycles in GTA IV is that when the player answeres his cell phone while driving a bike, he uses his right hand. In reality, this would disable his ability to accelerate, as the throttle is located on that side; in the game, the player is somehow still able to operate and accelerate the bike while talking on the phone. This page was last modified on 19 December 2014, at 22:42.